Before you start complimenting me, I will admit and confess that this is not mine. Though I wish it were mine, but not really. 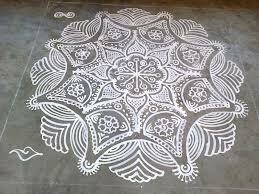 And ironically I am born in a family where ladies are lauded for their kolam skills. 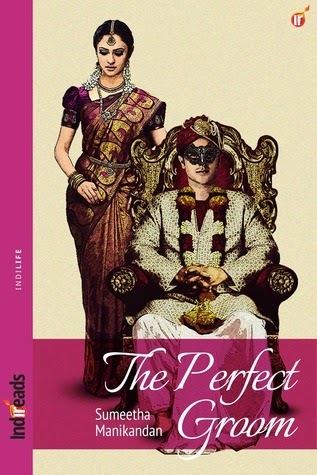 My mother, sister, aunt(s) and cousin(s) inherited the skill but by some quirk of fate, I didn't. While my sister got all the kolam genes of the family, I was happy to admire the symmetrical designs and the eclectic rangoli designs that she came up with. My mother didn't even attempt to get me interested in it because she has seen my creations on paper and knew how good my attempt would be, while on a half squat, on the floor. I didn't give much thought to the lack of this particular skill, until I got married. 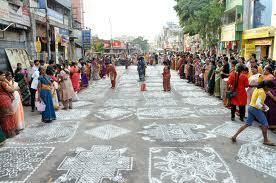 And I did dare to get married into an area, where women draw award winning kolam on their streets. First thing that I noticed about the whole process was that it is so bloody uncomfortable to squat on the floor and draw lines with the flour. 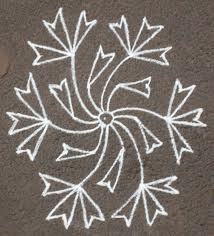 I tried to draw a part of my mother's kolam out of memory. It was a simple one that resembled a star. But why is the line not straight? Why are there gaps in this vanishing star? Does it even look like a star? After many attempts It looked like a weird asymmetrical star that has been stretched in the corners due to some bad photoshop. After a couple of attempts, I tried to disguise it by drawing some hook like designs after studying my neighbor's kolam. By now it was almost half hour since the Kolam began and I was still at it instead of getting ready. After looking at it from all angles, I decided that if you look at it diagonally from one side, it almost looked perfect. Huh! Who am i kidding? Just then the flower lady came and I had an inspiration! If I can decorate it with flowers I can hide the kolam under the flowers and what more it would look nice. So I checked out her flowers and selected the ones that I could use. But before I could start on it, something landed plonk on the kolam. It was the newspaper that the paper man threw from the ground floor landing with unerring accuracy on my doorstep. Just then, my father-in-law came out and found that the kolam was damaged due to the paper and pacified me saying that he would have a word with the guy to come upstairs and give it. Needless to say, I was happy that I escaped. But before they could realize that I knew next to nothing about putting kolam, my mother arranged some quick classes for me at home and I learnt.. one kolam which I churned out day after day.